3 Bedroom Semi Detached House For Sale in High Peak for Guide Price £450,000. This amazing Georgian residence has been vastly improved and maintained throughout. In brief an entrance porch, vestibule, spacious lounge, inner hallway, modern galley kitchen, utility/WC and a large conservatory. First floor landing, two double bedrooms and a period style bathroom. Second floor landing, double bedroom and large under eaves storage area ideal for a further bedroom or en-suite conversion. 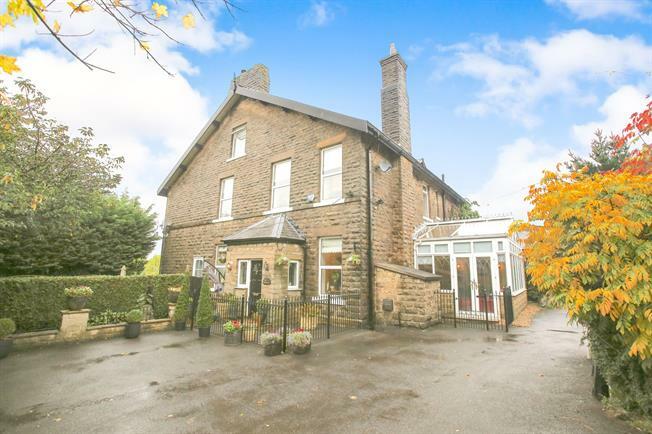 Other features include a large enclosed rear garden with elevated views towards Kinder Scout and train station walk able.. Fan light glazed entrance door. UPVC double glazed window to the front and side elevations. Courtesy light. Original panel glazed entrance door. Cornice. Oak walls and lead glazed panels. UPVC double glazed to the side elevation. Gas coal effect living flame fire complete with a decorative fire surround, tiled inset and matching hearth. Cornice. Picture rail. TV point. Single radiator. Split level staircase leading to the first floor accommodation. Dado rail. Under stairs storage cupboard. Single radiator. UPVC double glazed windows to the side and front elevations. Fitted matching range of wall, base and drawer units complete with rolled edge worktops. Integrated fan assisted double oven. Five ring gas hob. Extractor filter and light hood. Integrated dishwasher, fridge and freezer. One and half bowl and single drainer unit with mixer tap. Stable door. UPVC double glazed glazed window. Two piece matching polar white suite comprising a low level WC and a pedestal wash hand basin. Diamond patterned tiled floor. Plumbing for an automatic washing machine. UPVC double glazed windows to three elevations complete with matching French patio doors. Exposed timber floor. Vaulted ceiling. Wall light points. UPVC double glazed window. Airing cupboard. Single radiator. Dado rail. Banister rail. Split level staircase leading to the second floor accommodation. Two UPVC double glazed windows to the side elevation. Single radiator. Fitted matching range of Maple effect wardrobes, storage cupboards and bedside drawer units. Two ceiling roses. Dado rail. UPVC double glazed window to the side elevation. Single radiator. Picture rail. UPVC double glazed window. Three piece matching polar white suite comprising a low level WC, pedestal wash hand basin and a panelled bath. Tile covered walls. Heated towel rail. Halogen down lights. Skylight. Banister rail. Dado rail. Wall light point. UPVC double glazed window to the side elevation. Cast iron feature fireplace (decorative use only). Dado rail. Halogen down lights. Access to under eaves storage. Sloping roofline. Potential additional bedroom/en-suite conversion. Large enclosed child/pet friendly rear garden with boundaries clearly defined by decorative bespoke wrought iron railings and dry stone walls. Mainly laid to lawn with borders stocked with a variety of perennial flora. Paved patio area. Stone paved side court yard ideal for entertaining on those long summer evenings with decorative bespoke wrought iron railings. Off road parking for several family vehicles.